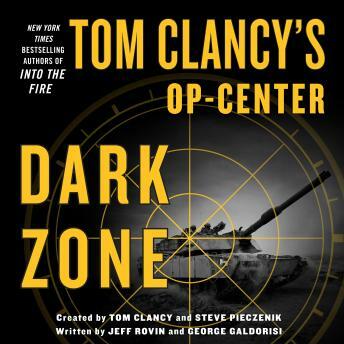 In Dark Zone, a race-to-the-finish thriller in the New York Times bestselling Tom Clancy's Op-Center series, the brutal murder of an undercover agent reveals a plot to incite a full-fledged war between Russia and Ukraine. Former US Ambassador to the Ukraine Douglas Flannery meets with an old friend and former spy near New York's South Street Seaport. She is seeking his help to thwart a Russian plan to overrun her native Ukraine, but those for whom she is working propose an infinitely more dangerous scheme, one that could draw in NATO forces and possibly ignite World War III. Moments later, as she jogs along the East River, her throat is slashed. Within hours, Op-Center learns of the killing and alarm bells go off. Director Chase Williams and his team have been following events as Ukraine, her NATO allies, and Russia rapidly deploy forces in a dangerous game of brinksmanship. But the secret that Flannery has learned threatens to take the looming battle to a whole new and very lethal level. Using cutting edge techniques of cyber warfare and spycraft, Op-Center must respond to the rapidly unfolding crisis before the U.S. is forced to take sides in a conflict that could change history.